Wallpaper Search Is Now Easier In Google ! This is the latest feature comes forgoogle-brings-color-selector-to-search-by-color/"> Google Image Search to find out the beautiful wallpapers for decorating the desktop. Here we have given the simple steps to how-to-filter-file-types-in-google-video-search-results/">use the feature. 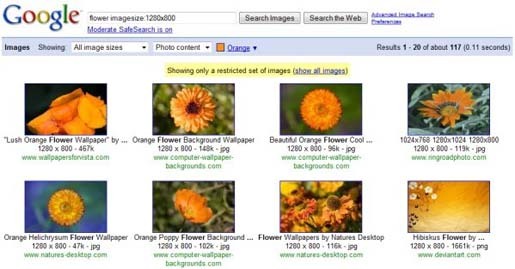 compare-google-and-yahoo-image-search-which-is-the-best/">Which is the best Image Search - Google Or Yahoo ? 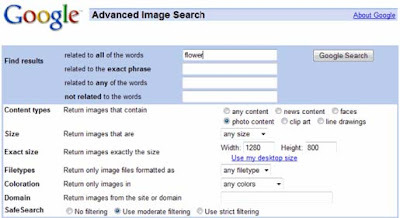 •First go to Google Image Search and choose “make-your-own-name-search/">Advanced Image Search”. •Then enter the query in the first input box. For example – Flower. •Then choose the “Photo Content” from the list of advanced-youtube-search-options/">content types. •Then click on “gmail-20-offers-a-new-contact-manager-with-updated-search-option/">Use My Desktop Size” to get the images appropriate for your desktop. •If you want search color wise just click on “google-brings-feature-to-search-images-by-color/">All Colors” and choose any one.